One possible location in the Kakaako district of Honolulu to be considered for the Barack Obama Presidential Library. Four universities in Chicago, New York and Honolulu are trying to outdo one another as they compete to host Barack Obama's future presidential library. Each is offering primo real estate, major financial backing and a grand vision for what the library should look like, and next week, a handful of Obama's oldest friends will start picking the winner. A look at what each school is proposing. WASHINGTON (AP) — Three U.S. cities that President Barack Obama once called home are trying to outdo one another as the competition to host his future presidential library comes to a close. Next week, a handful of Obama's oldest friends and associates will start judging proposals from two universities in Chicago and one each in New York and Honolulu, and by the end of March, Obama and the first lady will announce the winner. Knowing the future library will be a prominent tourist attraction and historical site, each community is offering Obama prime real estate, financial backing and grand visions for what his library could look like. The Barack Obama Foundation has requested specifics on a host of items, including local zoning and transportation, architectural design and management plans. But the foundation's board, which includes Obama's sister and his former campaign manager, has made clear that a university's ability to help pay for the project will also be a factor. All three cities' mayors are actively encouraging Obama to pick their communities. But the proposals, due next week, are confidential, and the competitors have been wary of tipping their hand by disclosing all the details. Likewise, Obama has been careful to say no city has an advantage. But Chicago, where Obama rose to prominence and had his children, is believed to have an inside track. Chicagoans make up half of the foundation's board, and Michelle Obama's former chief of staff is running the bid by the University of Chicago, where Obama taught law before becoming president. Only one city will host Obama's actual library, where government archivists will preserve his documents and artifacts. However, Obama could follow President Bill Clinton's model and house his library in one place and a presidential institute or foundation elsewhere. The private school on Chicago's South Side is proposing to build in one of the poor neighborhoods bordering its campus in Hyde Park, near Obama's home. At least three proposed sites include Chicago park land, the park district's board chairman has said. The university commissioned a study estimating the project would create 1,900 permanent jobs, with $220 million in annual economic impact and 800,000 annual visitors. Under Mayor Rahm Emanuel, Obama's former chief of staff, the city has worked with both of the competing Chicago universities to explore possible transportation and infrastructure upgrades at the winning site. The public university has proposed two sites on its Chicago campus, plus a third in North Lawndale, a heavily black neighborhood on the city's West side. That site would be in partnership with a community organization and would include a 23-acre park. The school's head librarian said a dozen university officials and volunteers worked on the proposal. The school has sought to show how each location is intimately tied to Chicago's rich history on civil rights and community activism, hoping to tap into themes in Obama's life that the library would aim to highlight. Appealing to Obama's economic ideals, North Lawndale leaders are billing the site as a chance for Obama to help drive growth in an impoverished area. The Ivy League school where Obama attended college has said almost nothing about its proposal, and the university declined to answer questions. But in a statement, the university said it wants to put the library in Manhattanville, also known as West Harlem, where Columbia is currently expanding with a satellite campus. People familiar with Columbia's proposal, who weren't authorized to comment publicly and demanded anonymity, said Columbia is also considering hosting just a part of the broader library project. New York Mayor Bill de Blasio seemed to suggest his city could be satisfied under that scenario when he told reporters at the White House this week, "We would obviously love to host a piece of it." 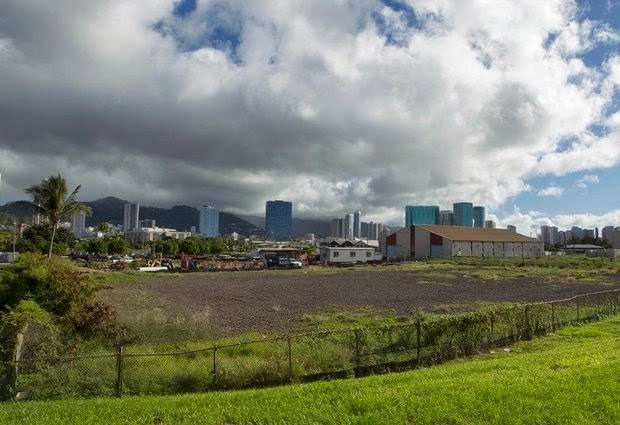 The showpiece of Honolulu's proposal to build the library in Obama's birthplace is a 7-acre plot of undeveloped, oceanfront property in a gritty corner of Honolulu called Kakaako, not far from downtown and the hopping Waikiki tourist zone. Visitors would have panoramic views stretching from Diamond Head, Honolulu's iconic volcanic crater, to the island's lush, fog-tipped mountains. Drawing on Obama's foreign policy emphasis on Asia, the university is pitching Hawaii as the ideal place for Obama to engage on global issues after the presidency, and wants to build a think tank and a young leadership academy into the project. The school has already raised money from Hawaii's legislature, residents and local companies.